Lavrentiy Pavlovich Beria (1899-1953) is mentioned in From Russia With Love a total of nine times, while explaining the current setup of the Soviet intelligence community. The first time is while Fleming describes the interior of the office of Colonel General Grubozaboyschikov – the head of SMERSH. On the walls are four large pictures in gold frames. In 1955, these were a portrait of Stalin over the door, one of Lenin between the two windows and, facing each other on the other two walls, portraits of Bulganin and, where until January 13th, 1954, a portrait of Beria had hung, a portrait of Army General Ivan Aleksandrovitch Serov, Chief of the Committee of State Security. At the end of the table, the representative of the Foreign Ministry, Lieutenant-General Vozdvishensky of R.U.M.I.D., watched the smoke curl up from the tip of his long Kazbek cigarette and remembered how Molotov had privately told him, when Beria was dead, that General G. would go far. There had been no great foresight in this prophecy, reflected Vozdvishensky. 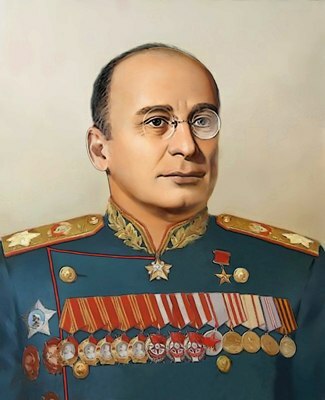 Beria had disliked G. and had constantly hindered his advancement, sidetracking him away from the main ladder of power into one of the minor departments of the then Ministry of State Security, which, on the death of Stalin, Beria had quickly abolished as a Ministry. Until 1952, G. had been deputy to one of the heads of this Ministry. When the post was abolished, he devoted his energies to plotting the downfall of Beria, working under the secret orders of the formidable General Serov, whose record put him out of even Beria’s reach. Serov, a Hero of the Soviet Union and a veteran of the famous predecessors of the M.G.B.–the Cheka, the Ogpu, the N.K.V.D. and the M.V.D.–was in every respect a bigger man than Beria. He had been directly behind the mass executions of the 1930s when a million died, he had been metteur en scene of most of the great Moscow show trials, he had organized the bloody genocide in the Central Caucasus in February 1944, and it was he who had inspired the mass deportations from the Baltic States and the kidnapping of the German atom and other scientists who had given Russia her great technical leap forward after the war. And Beria and all his court had gone to the gallows, while General G. had been given SMERSH as his reward. As for Army General Ivan Serov, he, with Bulganin and Khrushchev, now ruled Russia. One day, he might even stand on the peak, alone. But, guessed General Vozdvishensky, glancing up the table at the gleaming billiard-ball skull, probably with General G. not far behind him. Beria had been a trusted subordinate and even protege of Stalin before World War II, rising to the post of director of the People’s Commissariat for Internal Affairs, (N.K.V.D the department which oversaw the state security and police forces. Following the war, Stalin put Beria in charge of the Soviet atom bomb project. In the time leading up to Stalin’s death, he began to distrust Beria, and when Stalin died on March 5th of 1953, Beria could hardly contain his glee, even claiming that he had killed Stalin. Beria attempted to seize power for himself, but within a few months, a coup led by Nikita Khrushchev and Serov, who had served under Beria and now betrayed him, led to the arrest of Beria, who was tried and executed, along with some of his supporters in December of 1953. During his time in power however, Beria had merged the Ministry of State Security or MGB, into the MVD or Ministry of Internal Affairs. General G would’ve been impacted by this move, as outlined above. Following the ousting of Beria, Serov took control of the KGB. Serov checks in with General G prior to the meeting above.